Farm to Fork - Just Veg. We worked with seed breeders in Japan for more than six years to develop this carrot variety, specially suited to our sub-tropical climate in south-east Queensland. A carrot takes between 100 and 140 days from planting to be ready for harvest. In Queensland, carrots are a winter crop. The carrots are sliced into sticks and cut into shred in our high-care facility and then they’re ready to be packed into Just Veg. 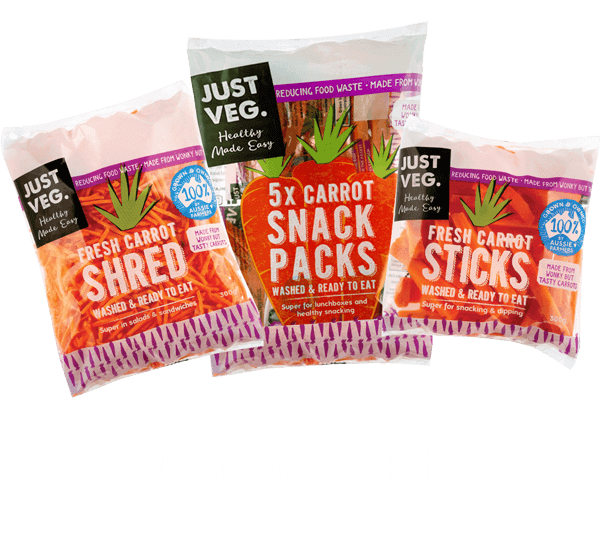 bags and sent to Woolworths Stores. While the carrots are growing we water them regularly and ensure they receive plenty of care and nutrition. The carrots are washed and kept cool to ensure they remain fresh and crunchy. As the carrots make their way around the factory – via water flumes – the skin is polished. The carrots are then sorted into different sizes. We harvest the carrots mechanically by lifting them from the ground by their green tops. The carrots are taken to our washing factory, which we like to call ‘wet & wild for carrots’. The carrots are sliced into sticks and cut into shred in our high-care facility and then they’re ready to be packed into Just Veg. bags. The carrots are often in bags within a few hours of harvest. Join today and be the first to know about new competitions, recipes and products!